If you want to make a dessert for Halloween or Thanksgiving that truly feels like fall, these pumpkin spice cupcakes with buttercream frosting are perfect. Who said cupcakes had to be for kids? Cupcakes have steadily grown in popularity and more and more people are experimenting with flavor combinations. 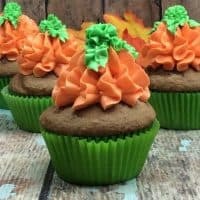 If you’re looking for something that can be enjoyed by both kids and adults, these pumpkin spice cupcakes are a great option. These pumpkin spiced cupcakes would be perfect for serving as dessert after a bowl of our slow cooker pumpkin chili — yum! 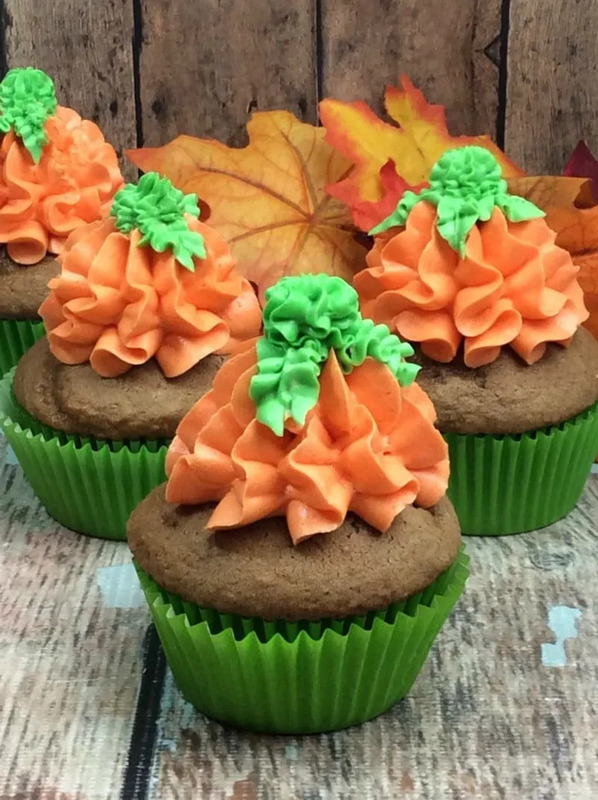 These pumpkin cupcakes are frosted to appear as if they have pumpkins on top. But, you could certainly frost them differently to make them appear more elegant. However, if you’re making cupcakes that will be enjoyed by everyone in the family, this frosting technique is both easy and delicious. 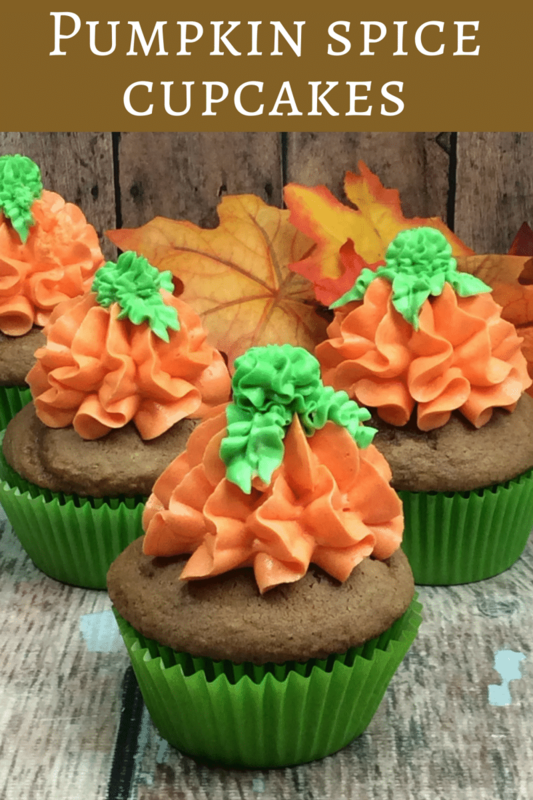 The pumpkin puree in this recipe will give you cupcakes that are incredible moist. Everyone will wonder how you were able to make a cupcake so moist. If your family loves the tang of cream cheese, you can also substitute the buttercream frosting in this recipe for cream cheese frosting. The combination of cream cheese and pumpkin is simply amazing. And, if you’re worried about the spices in these cupcakes, don’t be. You can cut back on or add more spices to create a spice level that you enjoy. These pumpkin spice cupcakes can also be made in advance and frozen. You can then thaw them overnight and top with your desired frosting. This is a perfect suggestion if you’re making these for Thanksgiving. It’s one less thing you have to worry about when getting your big meal together. If you want to make a dessert that truly feels like fall, these pumpkin spice cupcakes are perfect. The spices, pumpkin flavor, and creamy frosting will make them an instant hit. If you are looking for additional Autumn recipes, check out these Pumpkin French Toast Sticks, this Easy Crockpot Apple Cider or this Quick and Easy Applesauce. In a large bowl, combine flour, cinnamon, nutmeg, ginger, cloves, salt, baking soda and baking powder. Using a whisk, mix until combined, then set aside. Using a mixer, beat the butter, sugar, and brown sugar until creamy. Scoop batter into each cupcake liners until 3/4 full. Remove from oven and set aside to cool while you prepare the frosting. Using a mixer, combine the butter, powdered sugar, heavy whipping cream and vanilla, and mix until light and fluffy but stiff. Split frosting into two bowls. Use orange gel food coloring to make one orange, and green gel coloring to make one green. Scoop orange frosting into piping bag fitted with #8b tip and create an orange pumpkin in the center of the cupcake. Scoop green frosting into a piping bag fitted with #4b tip and add a stem in the middle of the pumpkin. Scoop green frosting into a piping bag fitted with #67 tip and pipe leaves around the edge of the stem. My sister loves pumpkin spice…I’m gonna save this and whip her up a batch this weekend. Thank You for the great recipe. Heck yes! pumpkin spice everything! These look delicious!! I love how you made the frosting look like little pumpkins! Changing out the buttercream for cream cheese frosting is exactly what I’m going to do when I make these this weekend! Yummm! So perfect for Fall! 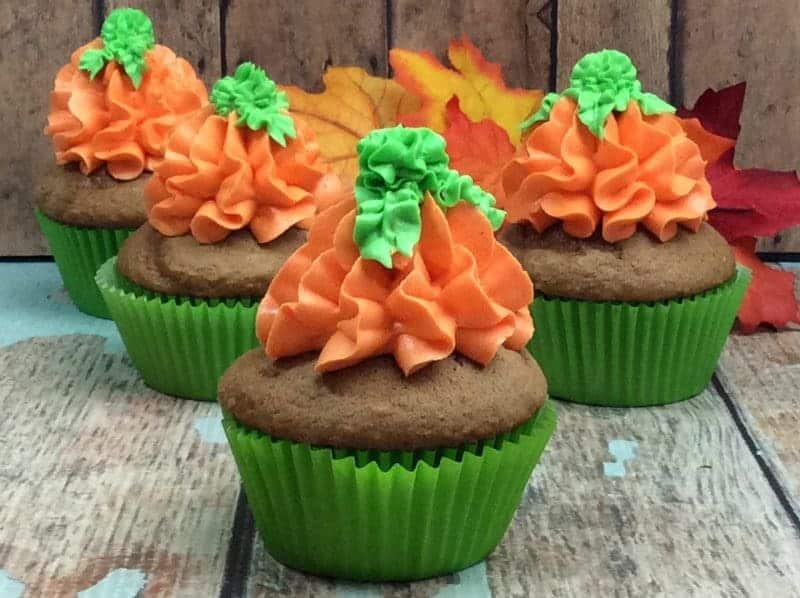 These pumpkin spice cupcakes are adorable! They look amazing and I bet they’re delicious! Can’t wait to make these for my kiddos! There is everything to love about this cupcake! Great flavors and cute presentation. These are so cute! I love pumpkin season – I look forward to getting one in our organic veg box each year. I’ll have to try this recipe! What perfect cupcakes – they look delicious! They’d go down a treat in my house. These look so cute! I can’t wait for pumpkin spice to be out on shelves near me!